Predictions for the eclipses are summarized in Figures 1, 2, 3, and 4. World maps show the regions of visibility for each eclipse. The lunar eclipse diagrams also include the path of the Moon through Earth’s shadow. Contact times for each principal phase are tabulated along with the magnitudes and geocentric coordinates of the Sun and Moon at greatest eclipse. Unless otherwise stated, all times and dates used in this publication are in Universal Time or UT. This astronomically derived time system is colloquially referred to as Greenwich Mean Time or GMT. To learn more about UT and how to convert UT to your own local time, see Time Zones and Universal Time. The first event of the year is a penumbral lunar eclipse occurring at the lunar orbit's ascending node in Leo. The apparent diameter of the Moon is larger than average since the eclipse occurs 4.4 days after after perigee. The Moon's orbital trajectory takes it through the northern part of Earth’s penumbral shadow as illustrated in Figure 1 along with a map illustrating worldwide visibility of the event. The times of the major eclipse phases are as follows. When the instant of greatest eclipse  occurrs at 00:43:54 UT1, the Moon lies at the zenith for a point in Mali near the capital city Bamako. The penumbral eclipse magnitude is very deep and peaks at 0.9883. This is close to being a total penumbral eclipse - the southern edge of the lunar limb lies just 0.4 arc-minutes outside the penumbral shadow. Note that the beginning and end of a penumbral eclipse are not visible to the eye. In fact, no shading can be detected until about 2/3 of the Moon's disk is immersed in the penumbra. This would place the period of eclipse visibility within about 3/4 hours of greatest eclipse (about 00:00 to 01:30 UT1). Keep in mind that this is only an estimate. Atmospheric conditions and the observer's visual acuity are important factors to consider. An interesting exercise is to note when penumbral shading is first and last seen. The entire eclipse is visible from Europe, Africa, western Asia, eastern North and South America. Observers in western North and South America miss the early stages of the eclipse while eastern Asia misses the late stages. None of the eclipse is visible from Japan, Australia or New Zealand. The Feb 11 eclipse is the 59th eclipse of Saros 114. This series began on 0971 May 13 and is composed of 71 lunar eclipses in the following sequence: 8 penumbral, 19 partial, 13 total, 12 partial, and 19 penumbral eclipses (Espenak and Meeus, 2009a). All eclipses in this series occur at the Moon’s ascending node. The Moon moves southward with respect to the node with each succeeding eclipse in the series and gamma decreases. The last eclipse of the series is on 2233 Jun 22. For additional details on this event, see the EclipseWise Prime Page on the Penumbral Lunar Eclipse of 2017 Feb 11. The first solar eclipse of 2017 occurs in Aquarius at the Moon’s descending node. T he central track of the annular eclipse crosses the Pacific Ocean, South America, the Atlantic Ocean and Africa. Countries in the annular path include Chile, Argentina, Angola, Zambia and Democratic Republic of the Congo. A partial eclipse is visible from a much larger region covering much of South America, Africa, and Antarctica (Figure 2). The width of the annular path is narrow along its entirety because the eclipse occurs only 4.7 days before perigee. As a consequence, the Sun appears only slightly larger than the Moon. The instant of greatest eclipse  occurs in the South Atlantic at 14:54:32 UT1 when the eclipse magnitude reaches 0.9922 (eclipse obscuration is 0.9845). At that instant, the duration of annularity is 44 seconds, the path width is 30.6 kilometres and the Sun is 63° above the horizon. During the course of its 3.2-hour trajectory, the antumbra's track is approximately 13,600 kilometres long and covers 0.15% of Earth's surface area. Path coordinates and central line circumstances are presented in Table 1. For additional details on this event, see the EclipseWise Prime Page on the Annular Solar Eclipse of 2017 Feb 26. The third eclipse of 2017 is a shallow partial lunar eclipse with an umbral eclipse magnitude of 0.2465. The Moon's orbital trajectory takes it through the northern part of Earth’s penumbral and umbral shadows. It should be easily visible to the naked eye as a dark shading in the southern quarter of the Moon. The lunar path through Earth’s shadows and a map illustrating worldwide visibility of the event are shown in Figure 3. The times of the major eclipse phases are listed below. The eclipse occurs at the Moon's descending node in Capricornus. At the instant of greatest eclipse (18:20:29 UT1) the Moon lies near the zenith from a location in the Indian Ocean south of India. The event is well placed for observers in Africa central Asia, and Australia. None of the eclipse will be visible from North and South America. The August 07 eclipse is the 61st eclipse of Saros 119. This series began on 0935 Oct 14 and is composed of 82 lunar eclipses in the following sequence: 20 penumbral, 8 partial, 28 total, 6 partial, and 8 penumbral eclipses (Espenak and Meeus, 2009a). The last eclipse of the series is on 2396 Mar 25. For additional details on this event, see the EclipseWise Prime Page on the Partial Lunar Eclipse of August 07. The total eclipse is visible from within a narrow corridor that traverses the United States from the Pacific Northwest to the Southeast crossing a dozen states: Oregon, Idaho, Wyoming, Nebraska, Kansas, Missouri, Illinois, Kentucky, Tennessee, Georgia, North Carolina and South Carolina (a tiny corner of Montana and Iowa are also inside the path). A partial eclipse is seen within the much broader path of the Moon's penumbral shadow, which includes all of North America, the northern third of South America, and westernmost Europe and Africa (Figure 4)). The central path begins in the North Pacific about 2400 kilometres west of North America at 16:49 UT1. The Moon’s umbral shadow travels 28 minutes before making first landfall along the Pacific coastline of Oregon at 17:16 UT1 (10:16 am PDT). The Sun's altitude is 39° during a totality lasting 1 minute 59 seconds. Unfortunately the Oregon coast is often subject to heavy morning fog, making it a concern to eclipse watchers. Rushing east, the umbra crosses the 3,000-foot-high Coast Range and into the Willamette Valley. The cities of Corvallis, Albany and Salem all lie deep in the path and have durations ranging from 1 minute 40 seconds to 1 minute 55 seconds. Coastal fog rarely comes this far inland and the mean cloud amount from ground records is ~50%. The 10,000-foot-high Cascade Range tends to have a drying effect on the air as the shadow descends into the Columbia Basin. This region is notable for having the statistically lowest cloud amount (25%) along the entire eclipse track. Madras residents get just over 2 minutes of totality. The area will be a major draw for the eclipse and most hotels are already booked. The elevation through eastern Oregon gradually climbs as the path reaches the Idaho border and the Snake River Plain. While Boise, Idaho's capital, lies just outside the eclipse track, it’s only a short drive to get into the path of totality early on eclipse day. To the east, Idaho Falls is deep in the path where totality lasts 1 minute 49 seconds. The duration is 2 minutes 18 seconds from the central line 34 kilometres further north. The weather prospects here are nearly as good as central Oregon. As it crosses the Teton Range, the shadow enters Wyoming and Grand Teton National Park. With its spectacular mountain scenery, the Tetons are always a popular tourist destination. Add a total eclipse and the region will likely experience some serious congestion. The central line passes through Jackson Hole's airport bringing 2 minutes 20 seconds of totality. Teton Park lies on the dry lee side of the mountains so the weather prospects are promising. But the lack of running room and the ability to reach a better location should weather conditions deteriorate on eclipse day could be an issue. East of the Wind River Range, the eclipse track stretches out across the high desert terrain of Wyoming. The central line passes though Casper where the duration reaches 2 minutes 26 seconds. Offering a mean cloud amount of ~40%, Casper lies at the intersection of good highways running over a 150 kilometres east and west within the eclipse path. The Astronomical League's annual convention AstroCon 2017 will occur in Casper the week prior to the eclipse. Gently rolling grasslands dominate much of the Nebraska landscape. Just north of the central line, Alliance enjoys 2 minutes 30 seconds of totality centered on 17:50 UT1 (11:50 am MDT). About 160 kilometres to the southeast, Interstate Highway 80 (I-80) crosses into the eclipse track and follows it for ~390 kilometres. An excellent eclipse viewing strategy is to choose this section of the path since it offers some of the best maneuverability to fine-tune one's location based on the weather forecast in the days leading up to the eclipse. While North Platte is inside the path, it is just 14 kilometres from the southern limit. Nevertheless, the duration there is 1 minute 46 seconds. The central line is 40 kilometres northeast where totality lasts 2 minutes 33 seconds. Continuing east on I-80, the interstate eventually curves deeper into the path and crosses the central line just south of Grand Island. The central duration is now 2 minutes 36 seconds with the Sun at an altitude of 60°. From west to east Nebraska’s average elevation slowly drops making the state a bit more susceptible to moist air from the Gulf of Mexico. This is reflected in the mean cloud amount that rises from ~45% to ~55% across the state. Departing Nebraska the eclipse path crosses the northeastern corner of Kansas and enters Missouri. The southern limit bisects Kansas City so residents there will observe either a deep partial eclipse, a grazing eclipse or a very short total eclipse, depending on their exact location with respect to the path edge. A similar situation holds true in St. Louis, which is bisected by the northern path limit. Missouri cities deep in the path include St. Joseph, Columbia and Jefferson City, all with totalities lasting about 2 and 1/2 minutes. Crossing the Mississippi River, the track enters southern Illinois. About 10 kilometres south of Carbondale, IL the central line duration reaches its maximum value of 2 minutes 40.3 seconds at 18:21:49 UT1 (1:21:49 pm CDT). Carbondale is being billed as Southern Illinois' "Eclipse Crossroads of America" since it also lies in the path of the Total Solar Eclipse of 2024 Apr 08. The weather prospects from Missouri to Illinois are strongly influenced by moisture-laden air from the Gulf of Mexico. The average cloud cover from surface observations hovers around 55%. Heavier cloud cover often comes from convective clouds usually developing in the afternoon. Fortunately the cooling effect of the partial phases before totality may help mitigate afternoon cloud formation. After fording the Ohio River, the umbral shadow enters Kentucky and the flat landscape gradually transforms into small, rolling hills. The instant of greatest eclipse occurs at 18:25:32 UT1 (1:25:32 pm CDT). This is the point where the axis of the lunar shadow passes closest to the centre of Earth. The auspicious event takes place in an unassuming sorghum field about 20 kilometres northwest of Hopkinsville, KY. The duration at greatest eclipse, 2 minutes 40.1 seconds, is less than 0.2 seconds shorter than greatest duration near Carbondale. While many may make a big fuss over a few tenths of a second, a clear sky is far more important. The weather forecast the day before the eclipse should be the ultimate guide in choosing a viewing site and not duration. 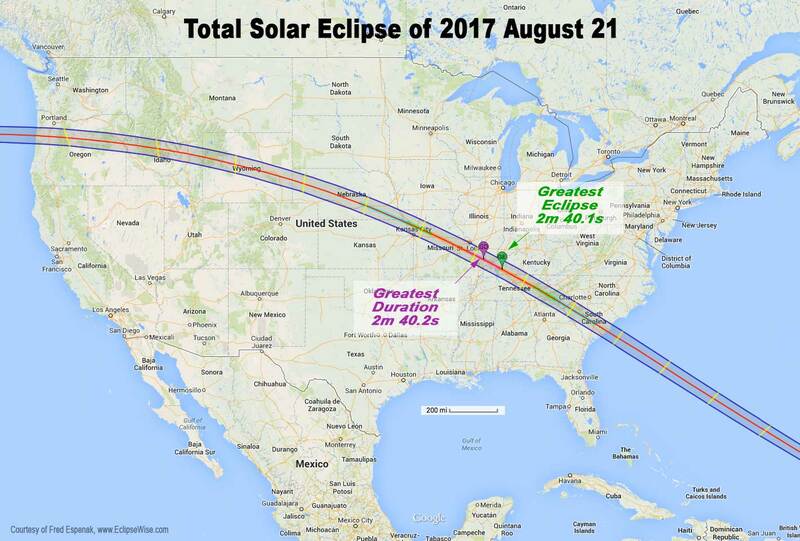 The eclipse track heads to the southeast as it enters Tennessee. Nashville is the largest city in the state lying within the path of totality. It is located ~2/3's of the way from the central line to the southern limit and receives 1 minute 56 seconds of totality. Another 44 seconds can be added by traveling 40 kilometres north to the central line. The eastern Tennessee cities of Knoxville and Chattanooga both lie just outside the path where ultra deep partial eclipses will be seen. At Tennessee's eastern border with North Carolina, the eclipse track crosses the Blue Ridge Mountains. While offering an inviting landscape of green mountains and valleys, this area has the highest mean cloud cover (~80%) along the entire track. To the south, the path clips the northeastern corner of Georgia before entering, South Carolina. Greenville and Andersonville are both deep in the path with the central line passing between them. The duration from the cities is 2 minutes 11 seconds and 2 minutes 34 seconds, respectively, centered at 19:39 UT1 (2:39 pm EDT) and the Sun at 63° altitude. Columbia is to the southeast and has a duration of 2 minutes 30 seconds. Just inside the southern limit is historic Charleston. The duration from downtown is 1 minute 29 seconds, while a 50-kilometre drive northeast to the central line offers 2 minutes 34 seconds. While the elevation drops sharply across South Carolina as the eclipse track heads to the Atlantic coast, afternoon cloud formation is often triggered by moist air from the Atlantic. The mean cloud amount ranges from 60% to 70%. The most promising observing sites are right along the Atlantic coast, but only if a sea breeze is present on eclipse day to keep clouds formed further inland at bay. Leaving the American coastline, the lunar shadow begins a 75-minute-long journey covering 5800 kilometres across the Atlantic before leaving Earth's surface at 20:02 UT1. Over the course of its 3.2-hour trajectory, the umbra's track is approximately 13,900 kilometres long and covers 0.26% of Earth's surface area. Path coordinates and central line circumstances are presented in Table 3. This is the 22nd eclipse of Saros 145 (Espenak and Meeus, 2006). All eclipses in the series occur at the Moon's ascending node and gamma decreases with each member in the family. The series is a young one that began with a partial eclipse on 1639 Jan 04. After 20 partial eclipses in the series, the first umbral eclipse occurred on 1891 Jun 06. The event was a short annular eclipse and was followed by a hybrid on 1909 Jun 17. The first total eclipse occurred on 1927 Jun 29. Since then, Saros 145 has continued to produce total eclipses including 1963 Jul 20 (Alaska, Canada, Maine), 1981 Jul 31 (Russia), and 1999 Aug 11 (Europe, Turkey, India). After 2017, the next three eclipses are 2035 Sep 02 (China, Japan), 2053 Sep 12 (North Africa), and 2071 Sep 23 (Mexico, South America). The last total eclipse occurs on 2648 Sep 09 with the series ending with a partial eclipse on 3009 Apr 17. Much more information and detailed maps for this event can be found in the recently published Eclipse Bulletin: The Total Solar Eclipse of 2017 August 21 (Espenak & Anderson, 2015) and the Road Atlas for the Total Solar Eclipse of 2017 (Espenak 2015). For additional details on this event, see the EclipseWise Prime Page on the Total Solar Eclipse of 2017 Aug 21. EclipseWise.com also has an expanded page with a rich collection of animations, weather, viewing and photography tips, maps and links on the 2017 total eclipse News Page: Total Solar Eclipse of 2017 Aug 21. A full report on eclipses during 2018 will be published in Observer's Handbook: 2018. EclipseWise.com is a website dedicated to predictions and information on eclipses of the Sun and Moon. It offers a graphically intuitive interface and contains maps, diagrams, tables, and information about every solar and lunar eclipse from 2000 BCE to 3000 CE. This period includes 11898 solar eclipses and 12064 lunar eclipses. Much of EclipseWise.com is based on the Thousand Year Canon of Solar Eclipses 1501 to 2500 (Espenak 2014a) and the Thousand Year Canon of Lunar Eclipses 1501 to 2500 (Espenak 2014b). These eclipse predictions use the Jet Propulsion Lab's DE406 — a computer ephemeris used for calculating high precision coordinates of the Sun and Moon for thousands of years into the past and future. The World Atlas of Solar Eclipses provides maps of all central eclipse paths from 2000 BCE to 3000 CE. All eclipse predictions were generated on a Macintosh G4 PowerPC using algorithms developed from the Explanatory Supplement  with additional algorithms from Meeus, Grosjean, and Vanderleen . The solar and lunar coordinates used in the eclipse predictions are based on the JPL DE405. For lunar eclipses, the diameter of the umbral and penumbral shadows were calculated using Danjon's rule of enlarging Earth's radius by 1/85 to compensate for the opacity of the terrestrial atmosphere; corrections for the mean effects of oblateness have also been included. All calculations, diagrams, tables, and opinions presented in this paper are those of the author, and he assumes full responsibility for their accuracy. "Eclipse Predictions by Fred Espenak, EclipseWise.com"
The use of diagrams and maps is permitted provided that they are unaltered (except for re-sizing) and the embedded credit line is not removed or covered. The instant of greatest eclipse for lunar eclipses occurs when the distance between the Moon's shadow axis and Earth's geocenter reaches a minimum. UT1 or Universal Time is the mean solar time on the Prime Meridian at Greenwich, England. Civil time signals are transmitted according to Coordinated Universal Time (UTC), which is based on International Atomic Time (TAI) with leap seconds added at irregular intervals to compensate for the slowing of Earth's rotation. The leap seconds keep UTC within 0.9 second of UT1. Penumbral eclipse magnitude is defined as the fraction of the Moon's diameter occulted by Earth’s penumbral shadow. The Saros is a period of 6,585.3 days (18 years 11 days 8 hours) in which eclipses (both solar and lunar) repeat. The geometry isn't exact but close enough for a Saros series to last 12 or more centuries. The instant of greatest eclipse for solar eclipses occurs when the distance between the Moon's shadow axis and Earth's geocenter reaches a minimum. Eclipse magnitude for solar eclipses is defined as the fraction of the Sun's diameter occulted by the Moon. Eclipse obscuration is defined as the fraction of the Sun's area occulted by the Moon. Umbral eclipse magnitude is defined as the fraction of the Moon's diameter occulted by Earth’s umbral shadow. Gamma is the distance of the Moon's shadow axis from Earth's center (in Earth radii) when it reaches its minimum absolute value. Chauvenet, W., Manual of Spherical and Practical Astronomy, Vol.1, 1891 (Dover edition 1961). Danjon, A., "Les éclipses de Lune par la pénombre en 1951," L'Astronomie, 65, 51-53 (Feb. 1951). Espenak, F., and Meeus, J., Five Millennium Canon of Solar Eclipses: –1999 to +3000 (2000 BCE to 3000 CE), NASA TP–2006-214141, Goddard Space Flight Center, Greenbelt, MD, 2006. Espenak, F., and Meeus, J., Five Millennium Canon of Lunar Eclipses: –1999 to +3000 (2000 BCE to 3000 CE), NASA TP–2009-214172, Goddard Space Flight Center, Greenbelt, MD, 2009a. Espenak, F., and Meeus, J., Five Millennium Catalog of Lunar Eclipses: –1999 to +3000 (2000 BCE to 3000 CE), NASA TP–2009-214173, Goddard Space Flight Center, Greenbelt, MD, 2009b. Espenak, F., and Meeus, J., Five Millennium Catalog of Solar Eclipses: –1999 to +3000 (2000 BCE to 3000 CE), NASA TP–2009-214174, Goddard Space Flight Center, Greenbelt, MD, 2009c. Espenak, F., Thousand Year Canon of Solar Eclipses 1501 to 2500, AstroPixels Publishing, Portal, AZ, 2014. Espenak, F., Thousand Year Canon of Lunar Eclipses 1501 to 2500, AstroPixels Publishing, Portal, AZ, 2014. Espenak, F., and Anderson, J., Eclipse Bulletin: The Total Solar Eclipse of 2017 August 21, AstroPixels Publishing, Portal, AZ, 2015. Espenak, F., Road Atlas for the Total Solar Eclipse of 2017, AstroPixels Publishing, Portal, AZ, 2015.